FLAWLESS MAKEUP FOR UP TO 16 HOURS. Is makeup meltdown ruining your midnight mojo? Mist on this weightless spray to give your makeup serious staying power. 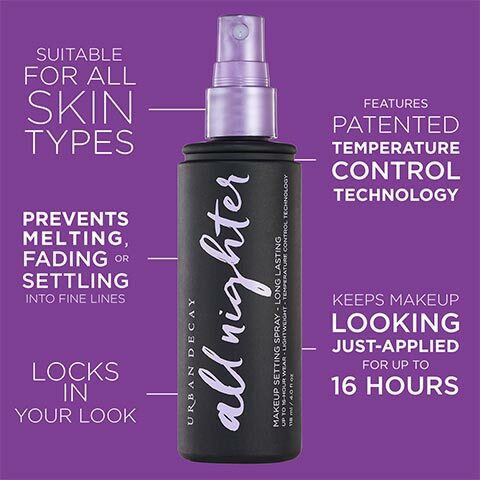 All Nighter Makeup Setting Spray keeps makeup looking gorgeously just-applied for up to 16 hours—without melting, fading or settling into fine lines. Our tested formula is suitable for all skin types (from oily skin to combination skin), is oil-free and paraben-free, and features patented Temperature Control Technology. Yep, this setting spray actually lowers the temperature of your makeup to keep foundation, eyeshadow, blush and concealer in place—even in hot and humid or cold and windy conditions. The result? Smoother-looking skin and vibrant makeup that lasts all day (or all night). How does All Nighter stand up to a night out with Chelsea Tyler? Discover how our #1 setting spray makes makeup last up to 16 hours. NEED MORE PROOF? TAKE UD FANS' WORD FOR IT. and when I woke up it STILL looked like I’d just left my house. This is the key product in my daily routine. This setting spray is amazing, your makeup will stay on fleek thru sweat, thru rain, it can battle anything!! my makeup still looks amazing!! I love this spray and will forever continue to use it and recommend it to my girlfriends. and never leave the evidence. It works so amazingly well.